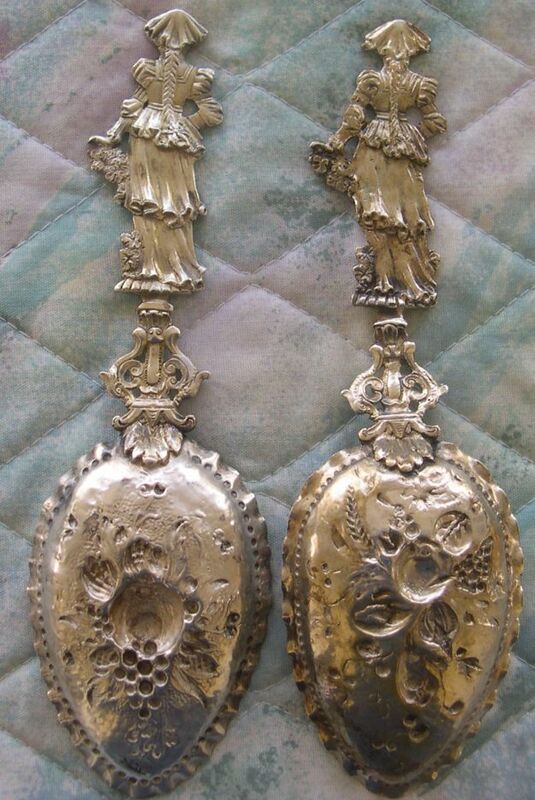 The spoons on this page appear to be silver, but there are no recognizable quality markings. 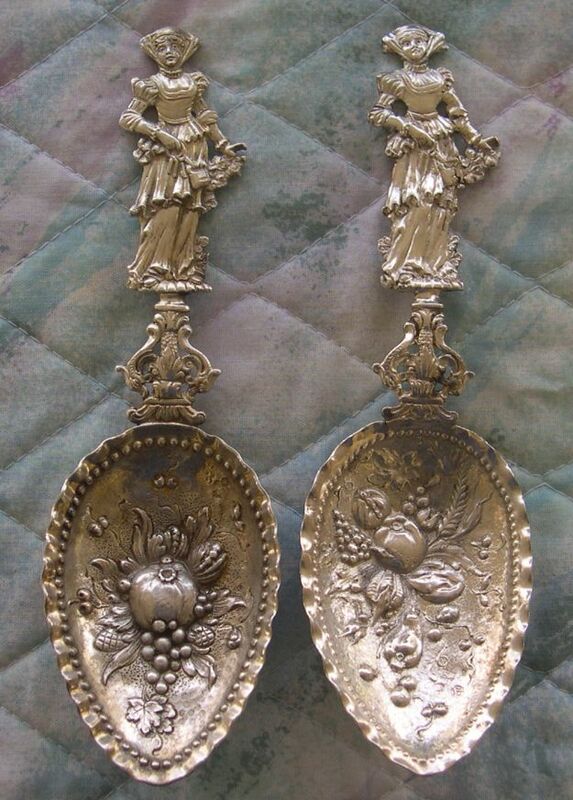 I would not be surprised to learn that they came from the same silversmith. These spoons are fairly large, so I have included a ruler and a normal sized tea spoon so that you can judge size. The handles are cast and then chased to improve the details and the bowls are all handworked. 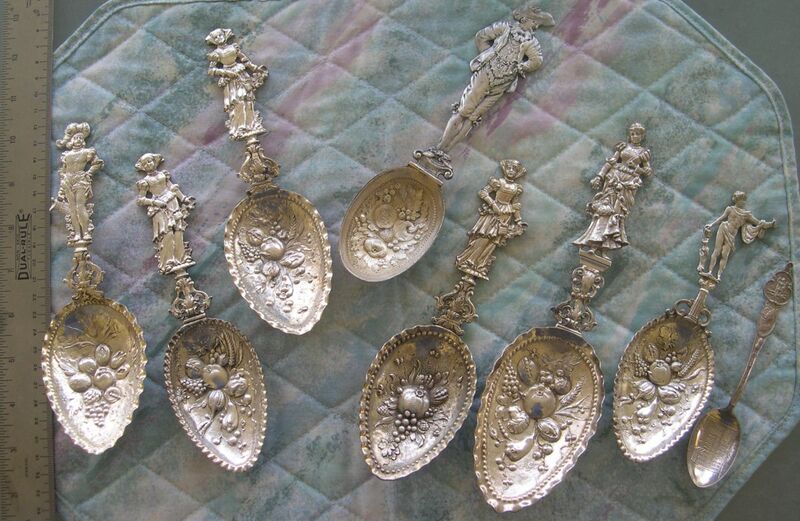 Observe the incredible detail workmanship that went into creating these spoons. In most cases, the figures are also completed on the back, and I will be showing both front and back views. Apollo is the Roman god of the Sun, Light, Archery, Medicine, and Poetry. He is the twin of Diana. Young noble lady carrying a rose in her right hand and clutching a bible to her chest with the left hand. A very nicely dressed noble man. Notice all the detail work in his clothes. This spoon and the two pictured below are almost identical --unless you examine them closely--then you will see a number of small subtle differences. They were all obviously produced by the same firm and most likely by the same silversmith who has done some excellent work.